Hello! It's time for a brand new Mojo Monday sketch (#209).. It is also contest week... I hope you will join us for a chance to win some Verve! I thought I'd better get a start on making some cards for my Christmas stash. I've made a few this year, but I haven't kept up with them as well as I have in the past. 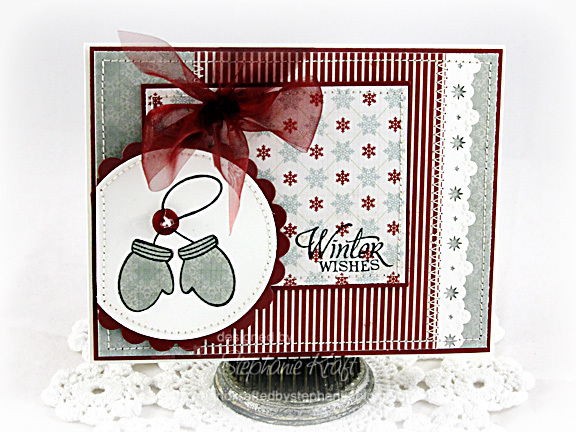 I used one of my favorite Verve Christmas sets, Winter Mittens. It's just a little 4" x 3" set, but I love the sweet images and sentiments in it. Accessories: Standard Circle and Scalloped Circle Nestabilities (Spellbinders), Snowflake border punch (Martha Stewart), Button, Ribbon, Twine (May Arts); Foam tape, Thread, Sewing machine. this is adorable, I have always luv these mittens....gorgeous papers and very nice stitching! So pretty Stephanie! Love that fancy border and the beautiful bow! Thanks for the inspiration! Fabulous card! Such pretty colors! What a sweet card - love the mittens! The card is just so sweet. I love it. I like the papers and the stamp. Great Card, the mittens are adorable. I don't think your stitching could be any prettier Stephanie,perfection! Very sweet card...cute mittens! Love this card!! The papers and stitching are wonderful!! Fantastic card!!! LOve that you have the circle off the card and that border is perfect!! love it!